Today was an incredibly busy day. I tried to catch up on a project, clean my office, find some notes, and make sure I have everything I need to cook a delicious Thanksgiving dinner on Thursday. In spite of my long to-do list, I accomplished a lot today and tomorrow looks to be another awesome day. The photo to the left (which you can click to see my other images at Flickr) was taken in Carrollton, Georgia this past weekend. 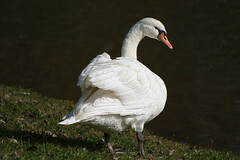 This Mute Swan made a great photo subject because it just stood there the whole time while I was about 20 feet away. President George W. Bush decided not to sign an international convention banning land mines. In an effort to prove he is no George Bush, President Barack Obama has instead decided not to sign an international convention banning land mines. The Obama administration has decided not to sign an international convention banning land mines. State Department spokesman Ian Kelly said Tuesday that the administration recently completed a review and decided not to change the Bush-era policy. “We decided that our land mine policy remains in effect,” he said. More than 150 countries have agreed to the Mine Ban Treaty’s provisions to end the production, use, stockpiling and trade in mines. Besides the United States, holdouts include: China, India, Pakistan, Myanmar and Russia. The more things change, the more they stay the same, huh? Just look at those other awesome countries doing the same thing! Doesn’t it seem a tad bit hypocritical when a convicted felon calls a hard-working respected governor “dangerous”? I bet Martha would change her tune if you offered her a good stock tip instead of cash compensation. In addition to health care reform and illegal immigration, it appears there may just be another battle on the horizon. It’s time to research the Clean Water Act of 1972, because the phrase “waters of the United States” includes a whole lot more water than the previous statement “navigable waters”. I’m no legal scholar, but upon first glance it appears that this new bill may violate the Constitution, which seems to be a constant theme with this administration and the powers that be in Congress. Gen. Stanley McChrystal has requested 40,000 additional troops for the war in Afghanistan. Gen. McChrystal graduated from West Point in 1976 and has served his country proudly ever since. He has a long and distinguished career in military matters and has extensive experience managing troops and making decisions to get the job done. President Barack Hussein Obama has decided to send just 34,000 troops to Afghanistan, or at least he thinks that may be his final answer. President Obama attended grade schools in Jakarta, Indonesia and high school in Honolulu, Hawaii. In 1983, he graduated from Columbia University in New York with a B.A. in political science. He served as a “community organizer” and he worked as a constitutional law professor for 12 years at the University of Chicago Law School. Since becoming President he has a long and distinguished record of delaying his decisions related to military matters, ignoring his commander(s) in the field, and he has accomplished little if anything when it comes to getting the job done. Imagine, for a moment, how different our nation would be today if their roles were reversed.